In Marx at the Margins, Kevin Anderson uncovers a variety of extensive but neglected texts by Marx that cast what we thought we knew about his work in a startlingly different light. Analyzing a variety of Marx’s writings, including journalistic work written for the New York Tribune, Anderson presents us with a Marx quite at odds with conventional interpretations. Rather than providing us with an account of Marx as an exclusively class-based thinker, Anderson here offers a portrait of Marx for the twenty-first century: a global theorist whose social critique was sensitive to the varieties of human social and historical development, including not just class, but nationalism, race, and ethnicity, as well. 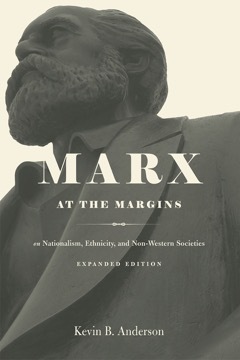 Through highly informed readings of work ranging from Marx’s unpublished 1879–82 notebooks to his passionate writings about the antislavery cause in the United States, this volume delivers a groundbreaking and canon-changing vision of Karl Marx that is sure to provoke lively debate in Marxist scholarship and beyond. For this expanded edition, Anderson has written a new preface that discusses the additional 1879–82 notebook material, as well as the influence of the Russian-American philosopher Raya Dunayevskaya on his thinking.